A rough two hour ferry ride put OPOE on the island of Barbuda. Dry, flat, quiet, and full of cacti, beach grasses, donkeys, and horses, Barbuda feels like no other place OPOE has been in the Caribbean. The population is around 1,600, and the land is low-lying. 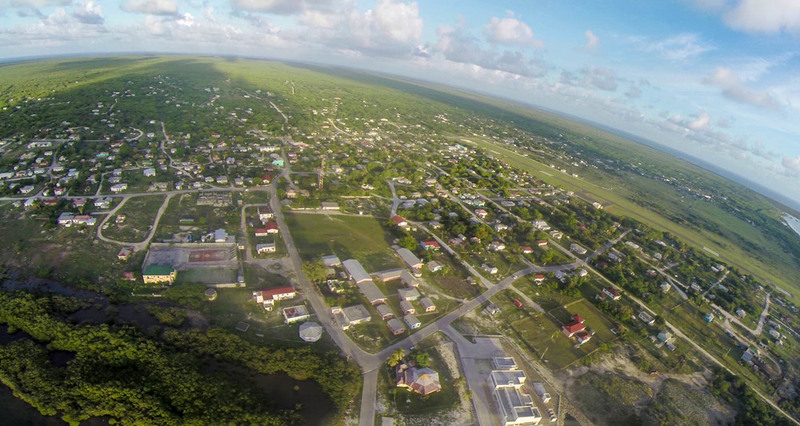 The elevation is approx 18 feet in Codrington (the only village) and 134 feet at its highest point. The people are warm, friendly, and proud of their unique sunny island. During our visit to Barbuda, things just seemed to come together, one after the other. In terms of climate change, Barbuda is an interesting mix of assets and challenges. For example: despite its arid climate, Barbuda's limestone foundation collects and holds rainwater remarkably well. Underground wells provide ample freshwater for the local inhabitants and there are also many above-ground ponds scattered around the island. These ponds are used mostly by grazing animals and other wild creatures like boar, deer, and donkey. But while these ponds are prime collection points for rainwater, because of increased drought many now lay empty (see photo above). And while the limestone is ideal for water retention, the soil on top is not ideal for agriculture and food production on the island is challenging. 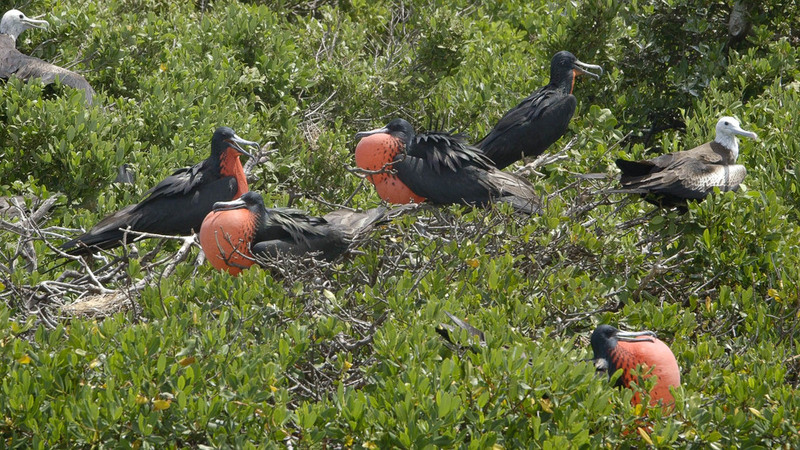 Another example is Codrington Lagoon: The lagoon is home to the largest Frigate Bird sanctuary in the Caribbean, houses a valuable juvenile lobster population, and is also a popular tourist attraction for picnics and water activities. According to the Codrington Lagoon Management Plan, the lagoon is important for "replenishment of offshore ecosystems, especially coral reefs," and the surrounding mangroves protect the main town of Codrington from storm surges and hurricanes. 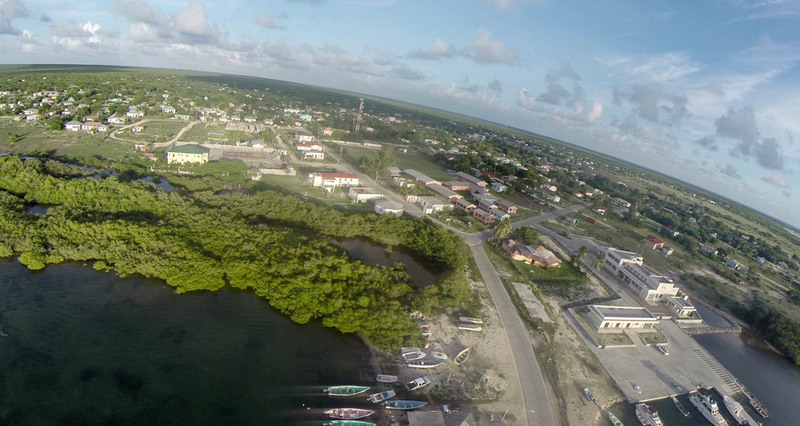 According to the same report, the Codrington lagoon supports an "estimated 60% of the Barbuda economy". Despite the health of the lagoon, overfishing of lobster and other fish, increased hurricane activity, sand mining, pollution, rising sea levels and shifting sandbars, have pushed the lagoon to the point where strong management practices must be put in place to preserve this valuable resource. 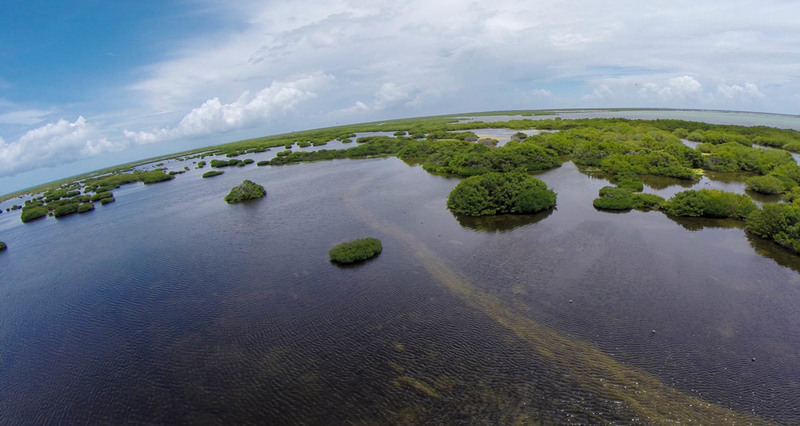 The Codrington Lagoon is a vibrant and integral asset to the people of Barbuda and the challenges of preserving the area are many: balancing ecosystem health and livelihoods; developing sustainable tourism and development in the area; reducing waste; enforcing protected areas, etc. In short: the preservation of the lagoon means the preservation of the community - and the type of approach Barbuda takes to the management and development of the lagoon will have a strong and long-lasting influence on the community. As such, there are a number of initiatives already underway to protect and manage the lagoon, including: adding the lagoon to the list of UNESCO World Heritage Sites, development of the Codrington Lagoon National Park, and the contentious and extensive Blue Halo project - which will close fishing in the lagoon for 2 years, and establish a permanent marine preserve around 1/3 of the island. On our first evening on the island, while walking home from the small grocery story in town I was stopped by a man in a pickup truck. He asked, curiously, what I was doing on the island. I explained about OPOE and how we were working on a climate change film. "Well I'm in the environment," he said. "I work for Parks." His name was Henry, and it turns out we were neighbors. He gave me a ride home and on the way offered to set up a trip to see some of the changes in the landscape around the island. He explained that there is a road they used to use, but it's not there anymore. The sea has covered it up. Henry said that he'd arrange a driver and pick us up at 9:00AM the next morning. Henry Griffin at White Bay, Barbuda. The changes to Barbuda's landscape are apparent all around. At White Bay (not far from Princess Diana beach - where the princess used to stay) Henry Griffin (photo left) stands on a narrow slip of beach, about 2 meters wide. Just 7 years ago, when the beach ran 100 meters further out, Henry and his friends would congregate to picnic and play cricket on the sand. Now, because of rising sea levels, the cricket games have moved into town to a grass pitch. Also pictured is Zander (below), who works for Codrington Lagoon as a ranger. Zander is perched on the edge of Spanish Point's limestone precipice. Because of increased storm surges and wave intensity, giant chunks of limestone are breaking away and falling into the ocean. Henry and Zander stand at the edge of an old cobbled road (photo left) which at one time led across to a coconut plantation across the way. The old road is now covered entirely by a stretch of water 20 meters wide. The following day another trip was arranged for us to see Codrington Lagoon. With Zander as our captain, we saw the Frigate Bird sanctuary, an underwater spring, and a strip of sandbar (see photo below) that was broken through during hurricane Luis in 1995. The holes in the sandbar have since been filled in, both naturally and with help from a USAID grant to build sand fences along the shoreline to trap sand and prevent further erosion. 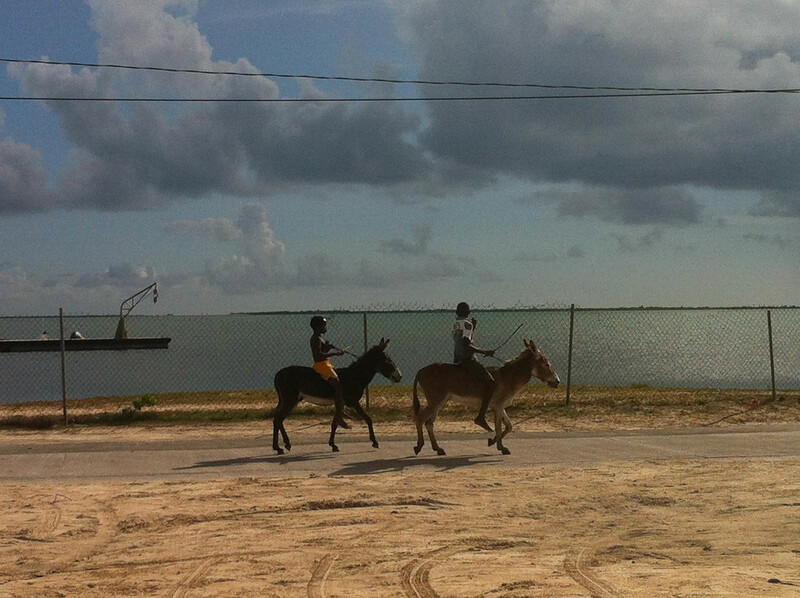 On our last evening in Barbuda, a figure appeared at our gate, walking a bicycle and sweating from the evening heat. A friendly and open presence, the man introduced himself as John Mussington, a Barbudan scientist and educator with whom we had been trying to get in touch since our arrival. John had taken it upon himself to ask around, track us down, and see if there was anything he could do for us during our visit. The following morning we met at the Barbuda Research Complex, a non-profit which includes the Barbuda Archaeological Research Center, Barbuda Museum, Barbuda Children’s Museum and the Barbuda Aquaponics Facility. John is one of the 5 Directors at BRC, along with Dwight Finch, Calvin Gore, Dr. Reg Murphy, and Dr. Sophia Perdikaris - currently the director of BRC. We talked with John for over 3 hours about his work on Barbuda, life on the island, and the challenges and successes of his work. One of the many topics we covered was the issue of development on the island and the struggle to determine what type of development is beneficial for a community. "What the young people are being told is that Barbuda needs development," said John. "What they are not saying is what kind of development. Development is not a 500 room hotel sitting on the coastline, where you can get a job to do the beds. Development is quality of life." John has an advanced degree in resource management and a background in marine biology and environmental sciences. John has been working in Barbuda since 1983 and has been involved in all conservation efforts on the island since 1991. "If we are to conserve the resources here, we must do so in a holistic manner," he explained. For John, Barbuda's future must be managed in harmony with the needs of both the community and the environment: management based on supporting livelihoods, investment in science, education and youth engagement, and using traditional types of knowledge to inform practices. John also brought up something we've come across as a continual refrain during our time in the Caribbean: the difficulty of demonstrating to people the value of what they have - right now. Talking about trying to reach the younger generation, John said, "I say, you have some of the highest quality of life right now! You have fresh air. You have food closest to the natural areas, where it is best. You have quietness. The environment is clean and healthy. People will actually pay millions of dollars to take your place!" Part of John's passion for the island, and his desire to protect it, stems from his fascination with Barbuda's beginnings. In 1834, then newly freed slaves were left to fend for themselves; to learn to cultivate the arid land, to fish, and to develop systems of resource management that have carried them through to this day. "As a biologist," said John, "I was fascinated by how they were able to maintain their livelihoods for such a long period of time on such a small island." I suspect that alongside this fascination of John's, lies a deep respect and pride for the island's inhabitants. A respect that places the island on a continuum - a continuum that includes the history, culture, and long evolving knowledge base that has brought Barbuda as a people, and an island, to this present day. And these are all things John believes should not be given away for free, especially to outside developers or corporations. "There's this notion that has gained ground over the years: the concepts of development and investment. And they're very skewed. Development is seen as something an investor brings for you. But what I am trying to get young people to understand is, is that we are all investors. And as local people, we have invested more than any other investor can ever have. Because we have invested our lives." When talking to John, even though he is fighting many uphill battles, you get the feeling that he will never give up. As an educator, what keeps him going is reaching that one person. 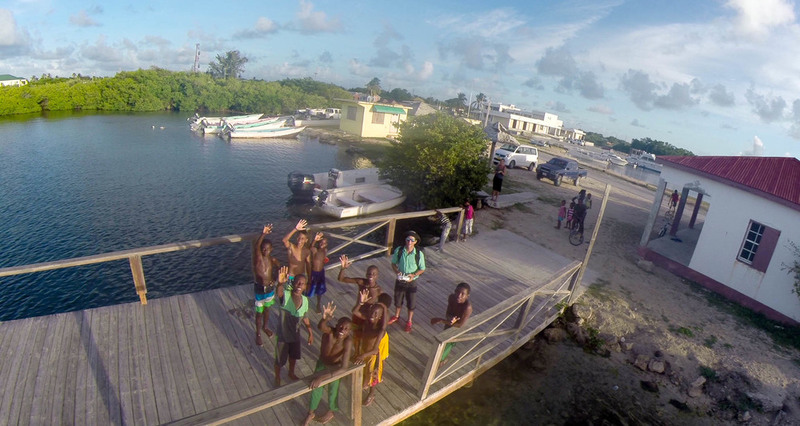 Whether it's helping someone experience the wonders of a reef system, or illustrating how you can look at the Codrington Lagoon, in its historical and cultural context, as the heart of the community - education is what keeps him going. And reaching that one person may now be critical for the future of Barbuda. "Barbuda is positioned at a crossroads." said John, "We have been at that crossroads for a while now, and we can swing in either direction. And a bad decision can end us up as a nation of beggars. Because we would have lost our heritage, we would have lost control of our resources, and we would have lost any potential in terms of continuing to make a living." After the interview, John gave us a tour of the BRC, and at one point we stopped at a colorful mural painted on the wall of the complex. 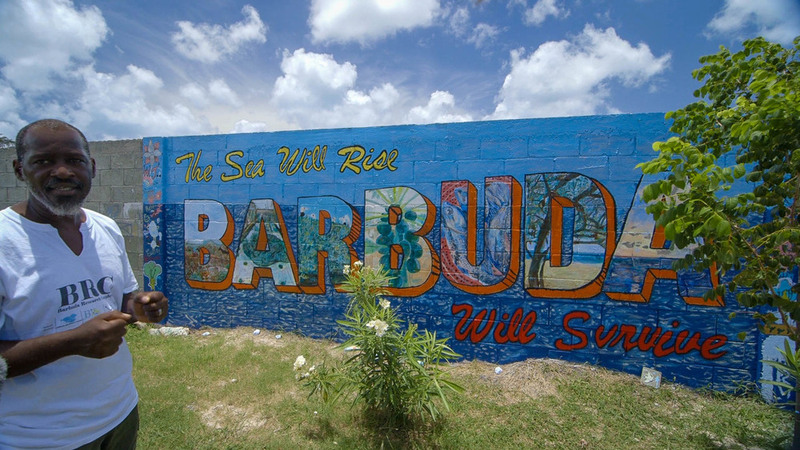 It said, "The Sea Will Rise, But Barbuda Will Survive." Created by local youth and visiting artist Noel Hefele (as part of BRC's visiting artist's program) the mural depicts both the challenges facing the island, but also some of the things that people can do to overcome those challenges. "The message is simple - the sea will rise but Barbuda will survive. And that’s a message that we need to get to the young people out there: that climate change is not all doom and gloom. And there are things you can do to adapt."